Rice is the staple food of Burma and an essential part of Mon agriculture. It is what feeds the majority of people in Lower Burma and is one of Mon State’s primary exports. But this year rice is in short supply due to a treacherous trinity of problems that have attacked Mon farmers from all sides. Second, an invasion of snails has complicated efforts to maintain remaining rice plants and hampered those trying to re-cultivate. A zoologist who spoke with HURFOM said these snails, known as golden apple snails, are part of a species that is new to the region. They feed on the rice plants and lay thousands of eggs. Due to their rapid rate of reproduction, they can quickly overtake a rice field. Third, farm rats have taken shelter in the fields that were least damaged by floods. In doing so, they built underground nests from which an increasing number of rats emerge to eat the panicles. Farmers, former officials, and experts, have predicted that this year’s production of rice will not meet the needs of Mon State. Meanwhile, the government has yet to officially acknowledge there is even a problem. Some of the interviewees in this report opined that the government is not in the business of telling the truth, and officials have habitually reported false numbers to higher-ups in a chain of continuing false information. At the local level, for their part, authorities have forced beleaguered farmers to pay taxes for repairs to the Win Pa-noon dam and work in projects having similar characteristics as Loh Ah-Pay. But ill-equipped and under-supported, the farmers struggle to remove and kill all the snails and rats. In some cases, farmers have been forced to re-cultivate certain paddies owned by the government at their own expense. 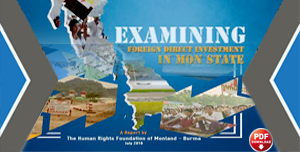 This report concerns the villagers in Mon State, where most of the inhabitants are Mon with some Karen. It is a collection of survey research over three distinct problems –flooding, snails, and rats – that have adversely affect farmers. 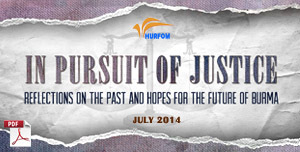 It draws from interviews of 46 people, ranging from farmers, former civil servants, businessmen, and academics. This report draws from 50 farmers, 2 experts on agriculture and irrigation, and 4 former civil servants from the Ministry of Agriculture & Irrigation. All interviews were conducted in August and September of 2011. In Mon State, there are, in total, 1,352,946 acres of rainy-season paddy rice, comprised in two districts, Moulmein District – which has 461,473 acres – and Thaton District – which has 430,000. However, due to limited resources and labor, only roughly 800,000 acres are cultivated. Usually, the rice produced in Mon State is distributed to all parts of Lower Burma, including Karen State, and Tenissarim Division. According to Mi Yow Palar Agricultural Service, farmers in Mon State invest equally in paddy rice cultivation as they do in rubber cultivation, which is also one of the main exports. Though natural disasters – such as flooding, pests, and other destructive phenomena – are nothing new, this year the problems are more acute. Also, there is another unusual occurrence, which the farmers have not encountered before: this year snails are thriving among the paddy fields and damaging crops. The concurrence of severe flooding and destructive snails is developing into a serious problem for farmers. In the past, with proper investment, it was still possible to successfully re-cultivate over inundated farmland after the waters receded. However, this year, as the paddy fields are still flooded at the end of August, for local farmers, there is no such chance to re-grow the paddy seedlings and to re-cultivate the paddy. Interviews with local farmers from Mon and Karen states in September makes known that they feel the missing response from government authorities is a form of abuse. Local farmers are very frustrated with the lack of support, education (agricultural and technical), and overall responsibility for protecting them that had been promised by their leaders while campaigning for the nationwide elections. “It is as if we are thirsty while riding a raft; it seems like we farmers will go hungry,” lamented a farmer from Chaung Zone Township. This despondent mood is rife among the farmers of Mon State, which is one of the largest rice producers in Burma. It has been called the “rice basket of Lower Burma” owing to its seasonal weather, the large number of acres devoted to farmland, and the concentration on paddy rice as one of the primary exports. Like the highly productive rubber trees grown throughout the region, rice is another important crop for the Mon people – such that it is considered ‘white gold’. As an essential part of the traditional Mon agriculture and livelihood, rice is cultivated annually. However, due to natural occurrences, such as unusually high levels of rainfall, sometimes farmland becomes over inundated with water. This September report shows that due to flooding from unusually high sea water, pests and other destructive insects, thousands of acres of cultivated paddy lands have been damaged. There was not enough time, money, and labor for the majority of farmers to re-arrange their paddy fields, to re-cultivate the paddies or prevent them from getting damaged. Local farmers are frustrated over the absence of support from the new state government in handling the effects of this natural disaster. Besides the lack of financial and technical support, and other helpful resources, some farmers face human rights abuses that are threatening their daily survival. This report draws from 50 interviews with local farmers across 4 townships, local government servants, and educated people in the region. It discusses how a plot of paddy field is cultivated during the rainy season and how much investment is required during the cultivation phase to the harvest. It goes on to report on how the local government continues to levy taxes on farmers even if the farm has been damaged by natural disasters, and how the government has failed to take responsibility for helping the farmers. 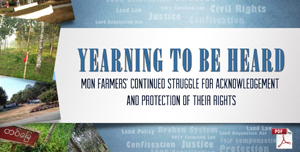 Finally, the report also reveals how the farmers have to face undue hardships amid natural disasters, such as extortion by township-based battalions and village administrations authorities. It reveals a picture of unwavering continuation of abuse by those with power, unchanged from the previous government. The concerned farmers expressed extreme worries of a food shortage and the fear they will go hungry this upcoming year. In Mudon Township, which produces the largest amount of wet season rice in Mon State, local farmers are frustrated that the heavy rain, which had began in June, hasn’t allowed water levels in the paddies to subside until the third week of August. Even with adequate resources to replant crops, there is not enough time. As a result, the local farmers cannot re-cultivate the paddies this year like in the past. Residents are very troubled with the prospect that there will be inadequate rice, leading them to go hungry. The local farmers warn that the flood waters will not flow out of the fields, but instead become stagnant. This is in variance with the Government Agricultural Service, which asserts that this year’s flooding is no different from previous years. The primary source of flood water is the overflow from the state-owned Win Pa-noon dam. This is due to problems with the channels for water running through the dam. Not only do they need repair, they are also too narrow and not high enough for water to flow out. This results in a greatly diminished flow. Consequently, excess water runs off into paddy fields, causing flooding. Flooding takes place every year. And in times past, we could re-plant the seedlings and re-cultivate the paddies after flooding. But this year, even for just the amount of rice for us to eat alone, we don’t have enough time to re-grow. The water level isn’t falling, and we wouldn’t have enough time to grow even if it did. It’s like this mainly because of the dam. The dam’s channels are getting shallow; and the government’s Agricultural and Irrigation Service is worried that the dam will collapse. So they opened the sluice gates, releasing a lot of water to flow out into the paddy fields. This is their responsibility – the Agricultural and Irrigation Service. And we are very frustrated with them because they do not even come to ask us, much less provide any help. For my family, we will definitely have to depend on rice bought from the market this year. As for income to support my family, I’ll try to find whatever jobs I can get. According to Nai Htun Win, it costs over 100,000 kyat for an acre of paddy rice to be grown, as it requires buying and broadcasting paddy seeds, pulling out and replanting the seedlings, and spraying fertilizers and pesticides. He added that this year, the majority of local farmers in Mudon received an uncommonly high level of rain, which flooded their paddy fields. But that problem has been magnified by the excess floodwater flowing out of the Win Pa-noon Dam. As a result, the converging floodwaters have remained in the fields for a lengthy period, destroying all paddy rice. According to our records, this year in Mudon Township, 50,000 acres of a total 80,000 acres are flooded. And of the entire inundated area, 30,000 acres of paddy rice are expected to be damaged. If there is any possibility of recovering some paddy rice, it will only be a few acres. But, the recovered amount is still not going to meet the amount we need for a year’s production; it’ll definitely be a sizable decrease from last year. Burma’s minister of Agriculture, U Myint Hlaing, has stated publically that a total of 880,000 acres of farmland has been cultivated in Mon State by the end of August. However, this statement does not disclose how many acres of paddy fields were damaged by pests and floods. When HURFOM contacted the State-level Myanmar Agricultural Service in September, asking how many acres of paddy rice fields were destroyed by flooding, they replied that they’re still making collection of it. The majority of local farmers from villages under Mudon Township Administration believed the main cause of the flooding in the region is the effect of the government-owned Win Pa-non dam. These farmers were interviewed in the following villages in August and September: Kwan Hlar, Abhit, Yawng Daung, Hnin Padaw, Kwan Ka-been, Kalaw Tow, Bat-do, Kaw Pee-htaw, Ka-marwat, Sein-taung, Sat-dwae, Do-mar. They do not come to ask us anything. The government servants have never come to help us when we are in trouble like this. But, at other times, they still come to collect the fees for fixing the channels of the Win Pa-non dam while continuing to release water from it. Now, even though we actually want to see their faces, they don’t show up. For us, we cannot re-cultivate the paddy this year. We do not have money to re-grow either. We will just live like this. If we go hungry, we will face it. Nothing can help. Throughout Mon State, a large number of acres of farms have been destroyed by inundation and snails and farm rats. Farmers from Chaung Zone Township estimated the number of paddy fields damaged by snails to be in the thousands. These snails, known as golden apple snails, feed on paddy seedlings, mature seedlings, and leaves, leaving only the stubbles. Snails have doubled the complications faced by farmers already beset with problems from severe flooding. Farmers that were interviewed faced enormous difficulties with re-cultivating their paddies owing to the lack of seedlings, the chance of more flooding, and the inadequate resources and time required. I have cultivated paddy for over 20 years… Now this year, I’ve faced my farm getting flooded and damaged by snails. At the end of June, 8 acres of paddy fields were finished cultivated but now no more than 4 acres are left without getting damaged. About 3 acres of paddy fields have been eaten by the snails within one month. And, one acre was destroyed by the flooding. 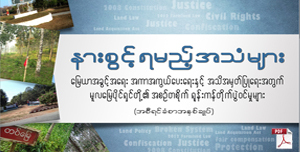 In total, I have lost 4 acres of my paddy fields, and the loss values about 500,000 kyat. Now, there is no possibility to re-grow. This is because I do not have enough time to re-do everything and the snails are still spreading throughout every field… Even if I had time to re-grow, I do not think I would have enough money to invest in growing the paddy again. So, this year, I just hope to get back our investment from the remaining 4 acres of paddy. The government never comes to give us any technical education and not even any help in dealing with pests or other problems. So, here, I just want to say that I do not think I can pay any taxes – collected with no specific reasons – and other fees for village development like I could in the past. I just cannot afford it anymore. This year, for us, we hardly have enough rice to survive. The majority of farmers interviewed decided not to re-cultivate the paddy because, based on their experiences, they predict there would be more losses. They say there is not enough time to grow another crop since rainy season will end soon. As a result, the paddies would not grow, blossom, and ripen. Owing to the government’s lack of transparency in these matters, the number of acres of paddy rice that have been destroyed is not known to the public. Local residents in Chaung Zone are further upset because aside not helping with the farmers’ plight, in the newspapers the government only acknowledges that paddy fields have been flooded – there is no mention of the many acres of farmland that has been damaged by the snails and rats. Farmers feel ignored and left to fend for themselves. Most of the paddies in Chaung Zone and Moulmein townships have been damaged by golden apple snails. Local farmers have desperately hoped to get some support from the state government, such as aid from the Agriculture and Irrigation Service or assistance with growing the paddy rice again. However, these farmers report that instead of helping them, the government has set up a project to clean up and remove pests from the paddies using the farmers as forced labor. While already upset with the damages caused by snails in my paddy fields alone, I was ordered to pick up the snails in every farm. The staff from Agricultural Service ordered us to pick up snails and put them gunny bags or sacks. Like going for Loh Ah Pay, we had to go for snail-removal duty two times. The first time was from August, 18th to the 23rd, and the second was from August 25th to end of the month. We had to pick up in any field, collecting the snails and putting them in sacks. For my farm, I had picked up almost the whole farm already. And, just as we need time to re-cultivate our damaged paddies, we farmers need time to take care of the remaining paddy rice. I think, the responsibility of picking up the snails should be taken by the government Agricultural Service. They should not order us to work like this while we are having troubles. When HURFOM contacted the manager of Chaung Zone Township Agriculture Service, asking why it needed to use labor of local famers to pick up the snails, the manager said that if the locals did not help pick up the snails, the snails would spread out further. Therefore, they did not wait for an order from the state government before organizing the local farmers to pick up snails as doing Loh Ah Pay. In Chaung Zone Township, of 65,760 total acres, he estimated that 20 percent of paddy acres have been damaged by the snails. But, he acknowledged, “the State has not disclosed this yet.”. Regardless of the number of damaged paddy fields they make known, for us this year we will definitely face the difficulty of having not enough rice to survive. Even though the township Agricultural Service can lie to the State [on the numbers of damaged paddies], for us, we cannot lie to our stomachs. Like before, now we cannot not depend on paddy rice from our farms to make offerings, support our children going to school, and to provide money for our health care. For us to survive, we just have to depend on the remaining 5 acres of paddy field. This kind of snail is a new species in Burma. We believe that this species has been coming via the Salween River since two years ago. And, now, it has reached Chaung Zone on Pa-luu Island. That’s how we think it happened. This is because I started seeing this species two years ago. Now, it has spread out. They really like eating small plants like paddy rice with soft stubbles and greenish-colored leaves, and they will lay eggs and produce offspring very fast. Because they multiply so quickly, it is devastating for the paddy fields. These snails are vivid red and are as big as chicken eggs. Sometimes, while they are eating the paddy, they lay their eggs, which are of a purplish color. The number of the eggs that they lay at once is thousands to ten thousands. Each one can eat up or damage the paddy for as long as 5-6 months, which is how long they live. So, accordingly, they will eat up the whole farm. That’s what we have studied. The chemicals that can kill them are made in Thailand, such THYOLIS. However,because the government does not seem to help much, the farmers will continue to struggle to eradicate these snails. Besides the damage caused by flooding and golden apple snails, many paddy fields in Mudon and Thanbyuzayat townships of Mon State were ruined by rats, resulting in even more losses of rice paddy plants. Because of the flooding, rats made their nests among the rice plants and fed on the early panicles, Consequently, even the rice plants that survived the flood were lost. Each rat weighs 20 to 25 kyattha (one kyattha = 16.32 grams) and the farmers are ill-equipped to handle the rat problem. The damage from rats was especially severe in the following villages: Ahbit, Kwan ka-been, Hnee-pa-daw, Kwan-hlar, Yawng Daung, Kaw Pee-Htaw, Kalaw Tow, Do-mar, Bat-do, Settwe, Ka-mar-wet, Lat-tat and Kyaik-Yel villages of Mudon Township, Mon State. From the 22nd of September to the end of the month, the condition of the paddy fields ruined by the rats was documented. Twenty-seven local farmers said that 42 percent of their cultivated acres were lost because the rats chewed away the paddy rice plants remaining after the flood. Unlike the others, just a few of my rice plants were damaged by the flood. My paddy field is a little bit far from where the flood occurred. However, the rats fled from the flooded paddy fields and came to make their nests in my farm. They dug holes among the rice plants and chewed the panicles. And they live in the holes. There too many rats; I can’t get rid of them all. About two acres of my seven-acre paddy field were damaged, in total. Moreover, these remaining rice plants are not well developed because they had to struggle from the flood of early rainy season. And besides low production of rice, some if it was damaged by the rats. So having enough food this year is our biggest concern. Ka-mar-wet, Sein-taung and Htaung-kay of this region and northern villages of Mudon Township were all impacted by the rats. Some farmers tried to defeat the rats by destroying their holes, but they weren’t successful. Now, only the rice plants that weren’t eaten by the rats are left. Twenty-seven local farmers of Ka-mar-wet and its surroundings, including Nai Both, each reported losing one to three acres of their paddy fields due to rats. This came as a double whammy to farmers as they had already lost over one-half of their paddy fields to flooding. In Thanbyuzayat Township, which borders Mudon Township in Mon State, damage from rats was especially severe in paddy fields that did not get flooded. Rats from flooded areas came and destroyed the surviving rice plants. “The rest of rice plants which was going to serve as food for the coming year was totally ruined,” said a group of distressed Mon farmers. They claimed there was a big loss of wet season paddy in the area between Phaung Sein and Kwan-hlar villages which are close to Mudon Township. The farmers explained that as soon as the first round of sowing paddy seeds had been done, heavy rain flooded the fields in the third week of May and persisted through September. During this period, one-third of the seedlings were destroyed, and every farmer was affected. In a region where nearly everyone is a farmer, this is devastating. In just Phaung Sein, Kwan-hlar, Kyar-kan and Wae-ka-ruu villages, there are over 5,000 farmers, and up to tens of thousands of acres belong to local farmers. Owing to losses from the floods, the snails, and the rats, many say they have no mood to continue farming. They are worried about covering the costs of their investments and haven’t received any support from the government. Disappointment and frustration are rife. Statistics from the Ministry of Agriculture and Irrigation of Mon State, which were cited by five staff from the Agricultural Service, confirm that there are over 47,000 acres of rainy-season paddy fields and over 20,000 acres in total were damaged by the flood and the rats. But, U Myint Hlaing, the minister of Agriculture and Irrigation, announced that up to this August, 880,000 acres of rain season paddy field had already been cultivated; however, the number of paddy fields affected by the floods, snails, and rats had not been announced yet. 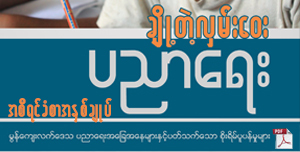 Already, interviews with agricultural business persons and experts reveal a consensus that the critically low rate of predicted paddy production will not meet the needs of Mon State. In addition to excessive flooding, which led to widespread crop losses, farmers were forced by the district-level authorities of Ministry of Agriculture and Irrigation to re-cultivate what was classified as ‘ideal’ paddy fields. The ideal paddy fields are those with special paddy species defined by the government, which are situated beside highways, railways, or by the front and back of foot paths. They are systematically cultivated in a row-by-row orientation. In these paddy fields, local farmers had to supply the labor for various tasks, such as harrowing soil to harvesting crops – all under the instruction of Ministry of Agriculture and Irrigation. The heavy rain in Mon State from early June to the middle of September broke the previous record of rainfall of 200 inches, and left paddy fields in Kyaik-ma-yaw and Paung townships over inundated. Most of the ideal paddy fields are situated in Ta-ra-nar, Kaw-thet, Kha-rom-pan villages, in Kyai-ma-yaw Township, and Ka-mar-be and A-hlat villages Paung Township – and they are all run under the instruction of the State Ministry of Agriculture and Irrigation. Each township has about 1,000 acres of ideal paddy fields owned by the government and almost all were destroyed at the second week of this September. In order to re-cultivate most of the ideal paddy fields, the State General Administration Department and State Ministry of Agriculture and Irrigation ordered local farmers to re-cultivate the ideal paddy fields, according to documentation obtained by HURFOM. Statistics from the report show that 2,000 acres of government-owned ideal paddy fields were destroyed in Kyaik-ma-yaw and Paug townships, and local farmers were forced to re-cultivate about 1,500 acres of ideal paddy fields. Further, from the third week of August to the second week of September, over 400 farmers from both townships were forced to re-cultivate government-owned paddy fields. An 80-acre ideal paddy field was re-cultivated by under authority of the township manager of the Ministry of Agriculture and Irrigation of Paung Township and the township’s governor using the labor of the local farmers. Despite their own hardships the farmers felt they had to participate in forced labor because they had to revive the government’s ideal paddy fields. They had alloted their ideal paddy field inside my paddy field and it flooded this year. There was a big loss. Even we could do nothing because it was a natural disaster. Then on August 22, the agricultural manager, U Soe Win, and his staff came and ordered me to re-cultivate the 4-acre flooded ideal paddy field. When I asked what they were going to provide in terms of support, they replied that they would support me with fertilizer sold at the government price and protect against insects. Like the others, I dared not to oppose the order of the government. Therefore, as soon as I got the order, I started harrowing soil with my three sons and hired workers. Their agricultural service staff came and helped in cultivating the rice plants row by row. Anyhow, ideal paddy field or any other (work) shouldn’t be done during this hardship period. Moreover, it cost me to hire labor and purchase more fertilizer and rice plants. So I’m in debt with about 300,000 kyat. Other farmers were also ordered to do so because they had ideal paddy fields. But the ideal paddy fields beside highways got more support. During HURFOM’s field research, most local farmers in Kyaik-ma-yaw Township were found restarting their farming mainly on ideal paddy fields and forecasted the production of rice to be low and late. Most of them said they had to serve in Loh Ah Pay-like activities because they daren’t make any complaints. According to estimates from 20 local cultivators, about 50,000 acres of a total 115,204 acres of rainy-season paddy field in Kyaik-ma-yaw Township were flooded. Among these 20, six of them had to participate in re-cultivating ideal paddy fields. Most of them said they were not satisfied because they had to work in the forced re-cultivation even though they were not listed as having to do so. 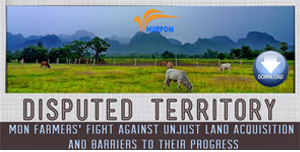 It is clear that farmers across Mon state have been overwhelmed by the cruel vicissitudes of nature. Heavy rains have flooded fields, invasive snails have taken over rice paddies, and rats have nibbled away at what was left. But the finding in this report also show that the farmers’ problems have been compounded by the inaction and ill-will of man: the state-owned Win Pa-noon dam is preventing flood waters from receding, authorities are forcing beleaguered farmers to perform laborious snail-removal duties without proper equipment, and government-owned paddies are re-cultivated at local farmers’ expenses. However, the unduly strains put on farmers by authorities, especially considering the impending food shortage, are nothing new. As reported on previously, locals from Thanbyuzayat and Mudon townships, and southern Moulmein townships, who live and work along the gas pipeline, have paid steadily-increasing security fees for ten years. They also have to maintain, and, at times, protect a gas pipeline that hazards the local environment and from which they receive no benefit. What is becoming increasingly clear is that despite Burma’s change to an ostensibly civilian-run government in 2010, the parasitic nature of government in relation to its people has yet to change. Officials show up for tax collection; but when villagers have problems, government servants are nowhere around. As such, farmers facing insolvency and a region on the verge of a food shortage have received no support. Meanwhile, public officials have yet to acknowledge the depths of the disaster, as no official tally of damages to farms has been released. In keeping with an Orwellian attitude, perhaps by not recognizing a problem, officials intend to avoid having to take any responsibility. Yet while it is easy to criticize and conjecture about the failings of government, what must not be lost in the discussion are the tangible consequences of failed leadership. Mon State is expected to have a rice shortfall this year; and as a result, many will face extreme hardship. The hard truth is that government officials can avoid talking about the scope of the problem, but in the end people will still go hungry. 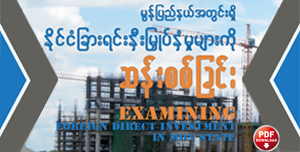 Put another way: Township-level authorities can lie to the state government, but, in the words of Nai Soe Thein of Bo-nat village, “we cannot lie to our stomachs”.